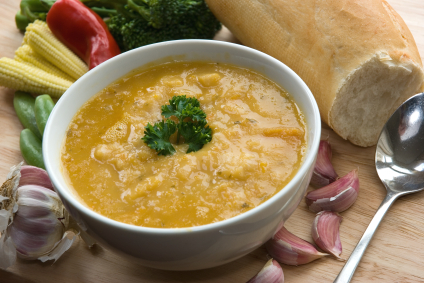 This is a very versatile soup that you can have for any meal. It’s actually great for breakfast. The high vitamin A content gives your immune system a great boost. Here is an interesting fact about carrots: Only about 5 percent of beta-carotene is absorbed from eating a raw carrot. Cooking makes 25 percent to 30 percent of carotenes available, and pureeing allows the body to absorb 50 percent. Beta-carotene gets converted to vitamin A in the body, but only in the presence of fat. Add grass-fed or raw butter, coconut oil or olive oil to your vegetables to get the full benefits. Saute onion in butter or olive oil until soft. Add carrots and thyme for 5 minutes while stirring. Add potatoes and garlic for 2 minutes. Add water and bring to a boil. Turn down to a simmer for 30 minutes. Meanwhile, place eggs in a covered pot with water and bring to a boil. Once the water reaches a boil, turn off the heat and keep the lid on. After 10 minutes, drain water and let eggs cool. Once the soup is done, use an immersion blender to puree the soup. If you don’t have an immersion blender, you can use a regular blender and puree it in batches. Once pureed, add 2 TB butter then salt to taste. With each bowl, add 1-2 eggs, grated cheese and chopped parsley.